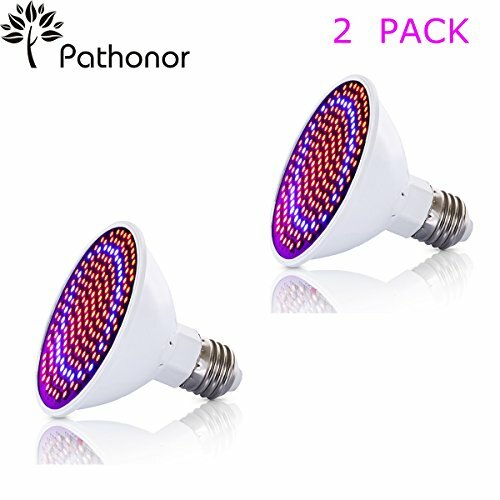 LED Grow Light Bulb 2 PACK , PATHONOR 20W E27/E26 LED Grow Light Plant light Bulb Greenhouse Plant lights Seedling Light 166 Red 34 Blue for Garden Greenhouse and Hydroponic Aquatic by PATHONOR at The Net Stores Network. MPN: PATHONOR Pousrewus426. Hurry! Limited time offer. Offer valid only while supplies last. ★PROFESSIONAL LED LIGHT PROPERTION:200 grow light bulbs inside.34pcs Blue grow light bulbs (430nm-460nm) + 166pcs Red grow light bulbs (630nm-660nm) . The perfect Proportion grow lights make your plants grow fast and healthy. ★ENERGY SAVING:20 Watt grow light bulbs and 2 pack grow light bulbs inside the package save electricity and budget, Cover 2-5 ㎡.Size:92mm*82mm(D*L), long life, up to 50,000 hours. ★SUPERIOR HEAT DISSIPATION: The grow light bulbs are made of heat-sink metal aluminum with finned heat-sink design,keeping temperatures at the appropriate level for plant growth without worrying about heat increased. ★EASY TO INSTALL:50W plant growing light designed to fit standard E27&E26 socket; It is easy to set up and use; Input Voltage: 85 V-265 V.
★LED GROW LIGHT BULB APPLICATION: Widely used in greenhouse plants, flowers, hydroponic systems and vegetable cultivation, corn, a few sun, rain, snow, indoor dark growth, to plant additional sunlight.